For the past 7 years, we have encountered thousands of clients with back aches and pains. Most clients belong to 3 categories – back aches due to medical reasons, back aches due to bad posture and back aches as a result of weak core and/or stress. And despite all these efforts, they wake up in pain every morning! Back aches and pain are not something that you should be dealing with daily. You can get rid of your back aches and pains permanently with no medication and surgery (except for those with medical issues). Let’s look at the 3 key causes of back aches and how Pilates Fitness Core & Body Aches Pilates class can help you. You experience pain because your body is using your muscles to support your daily activities in the wrong way. Let’s visualise that you have just completed a 42km marathon – will your legs be in pain the next day? Definitely! Similarly, the reason for your back aches is because you have over-worked specific back muscles. Those overworked muscles are feedbacking to you that they are not able to do any more work. Now, your immediate response will be – BUT I DIDN’T USE IT?! I DIDN’T MAKE MY BACK WORK HARD. Unfortunately, you have, unconsciously of course. When you sit, stand, move or lie down, you use your back muscles to support all stationary poses as well as movements. The trick is to spread the work to support your daily movements across all of your back muscles (for instance not only the lower right back), your abdominals, and sometimes even your glutes, your shoulders and other smaller muscle groups. When you fail to spread the work and rely solely on your poor back muscles to do these movements or stationary poses (like sitting or lying down), your back muscles will over work and they retaliate by being painful and sore. I’m very confident that Pilates will remove your back aches permanently. I am a firm believer because I am a sufferer of chronic back aches for many years. Practicing Pilates regularly have relieved all of my backaches, toned up my body, and kept me energetic and positive (as I aged). The transformation is so significant that I quit my mid management role in an MNC to start Pilates Fitness so that I can share the benefits with more people. 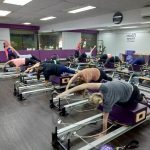 Thousands of Pilates Fitness clients over the past 7 years have also proved that Pilates Fitness Core & Body Aches help them to get rid of their back aches permanently. In fact, more than 80% of my clients are still doing Pilates weekly across our 3 studios since they started their first class with us.